I spotted this lovely box in Sainsburys (I think). I had to buy it, and my eldest decided to don his cheffing apron and make a batch of cakes with them for Halloween. I know it’s a bit past Halloween now, but these are great cup cakes for birthday parties. How many little boys could bypass some delightful cakes with tasty icing for a special occasion? The box contained enough cup cake cases and flag toppers to make up to 24 cakes. I think he did a pretty good job of the icing and decoration for his first attempt from start to finish at making cakes, with absolutely no help from mum (well ok, just a bit). He is rightly chuffed to bits with the outcome. Here is the recipe that he used to make his cakes. Add melted butter and sugar into a bowl, or mixer and mix until smooth. Add the four eggs and continue to mix until thoroughly mixed. Finally, add sifted flour and mix until the desired consistency is reached. I sometimes add an extra ounce or two of flour if I don't like the look of the mix. Place into the cupcake cases and bake for 15 - 18 minutes at 180 degrees. Makes your oven is pre-heated. When your cakes are cooked, take them out of the oven and let them cool before adding sugarcraft icing, sprinkles and the flags. « Are Fizzy Drinks Bad For Us? Hm … very interesting … that makes me think of the future. 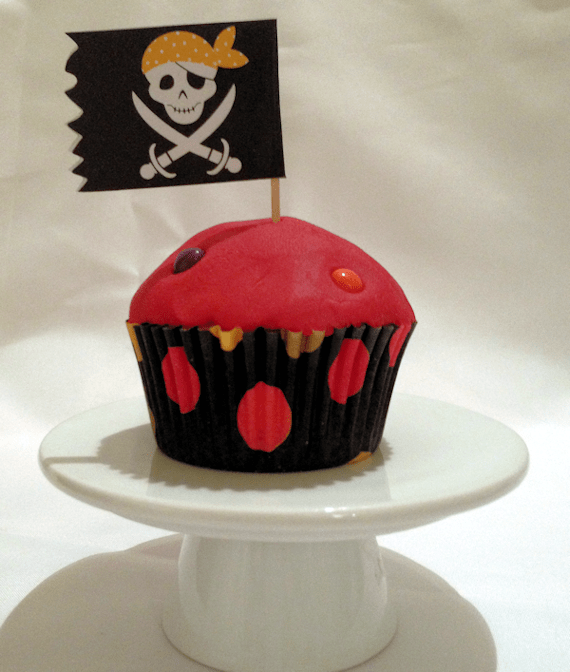 I like those pirate cupcakes. Makes me think of the blog challenge I want to put up next month. You are welcome to join with that, if you like. Anyway, it’s possible to have those cupcakes any time of the year. These are just lovely! 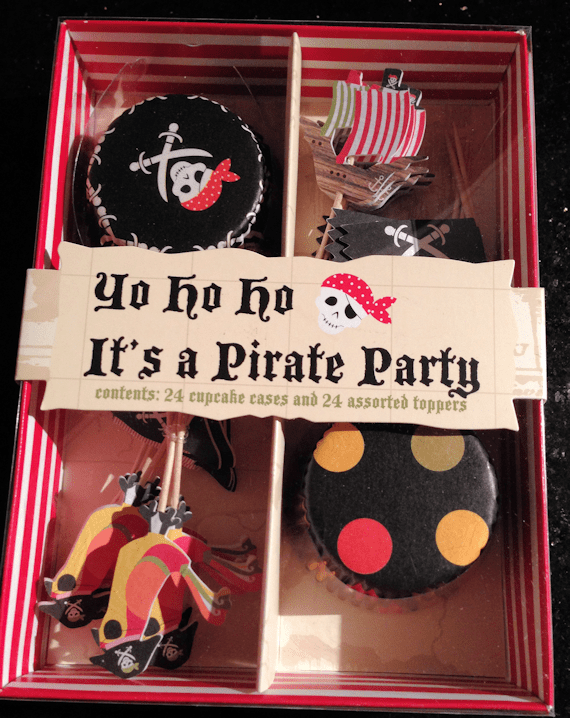 I must look out for the pack at the next birthday party, I don’t think we’ve had a pirate themed one yet. Too yummy and delicious.. i’m going to made it soon..
Hi – not sure if you know but there is a whole range of these lovely cup cake cases/boxes – I got some fairy ones for my daughter, but there are also pirates and other ones. Lots of independent gift retailers do them such as http://www.presentdays.co.uk and they are great for gifts to – to encourage kids to get baking! I’m not a cake person so I can take them or leave them. Give me crisps though, and thats a completely different ball game. I’d buy the kids again as they made the cakes look pretty good on the table. I have no idea why I said I’d buy the kids again lol, that was meant to be, I’d buy the kits again. They took a long time to make, I have to say. That red one looks ready for me to eat. I got a small one. The bigger cakes were reserved for the kids !!! !